Press & Media - Vicki White ​"The Science Lady"
Check out our Facebook feed to see where Vicki is today! "I am so happy that Vicki reached out to come do science at my school. As the science teacher, I have built a relationship with her over the past few years. Vicki is extremely easy to work with and fits her presentations with the curriculum that the students are learning. My students have an instant positive connection with her because her science presentations are hands-on, new, innovative, and engaging. I love having Vicki come into my classroom because she is fully prepared with all supplies and all I have to do is enjoy learning science alongside my students. 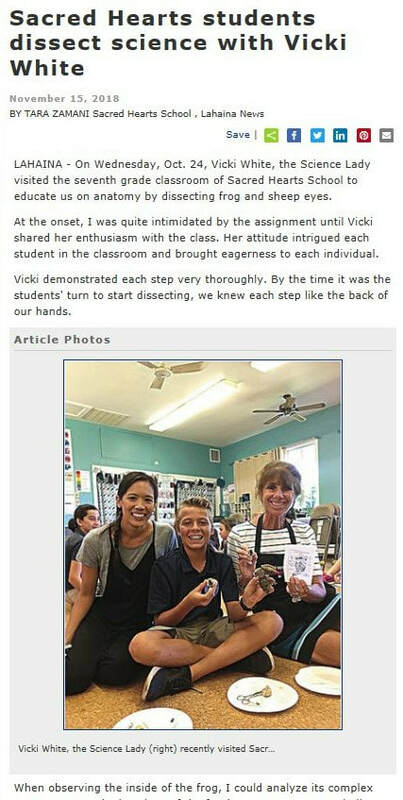 Vicki is one of the best guest speakers to come into my classroom and is welcomes in to my classroom anytime!" "Vicki the Science Lady wow-ed our students again! Teachers and parents were a-mazed! Kahalui School loves you!" "Vicky White truly is "The Science Lady!" Vicky makes science come alive as she identifies the various science applications and their value in today's world. Her ability to communicate understandable information is remarkable, because she regularly speaks to students of all ages who are at different levels of understanding. Vicky uses exciting props to enhance her presentations and as a result students leave with an excellent understanding of the various science studies. Coming from the mining industry, I appreciate Vicky's passion for explaining how important minerals are and how they are used in our every-day lives. I recommend that people of all ages take the time to sit in on at least one of her classes. You'll be glad you did!" "My Daughters always look forward to going to Ms Vicki’s science classes. They love the Hands-on activities and experiments, and I love that they are learning science in such an engaging way. Unlike learning science out of a textbook or by doing worksheets, Ms Vicki’s approach of having the kids do the science themselves really helps them retain what they learn. My kids appreciate the way Ms Vicki’s style of teaching allows them to think for themselves. Her energy and enthusiasm for the material transfers over to the kids, and my kids talk about their experiences for days following the class." "My grade 3 class was honored and Privileged to be selected with a visit by Ms Vicki White “The Science Lady” on Feb 3, 2012. Her Presentation was extremely captivating, informative, and addressed many of the Science benchmarks. She used pitch pipes, light bulbs, windsocks and more to demonstrate the wonders of Science. The students were focused, inquisitive, enlightened, and energized by her presentation. She encouraged the students to share their knowledge about energy, vibrations, liquids. solids, gases and The scientific method. We were inspired and thrilled with the wonders that the Science Lady brought to our classroom. Thank You so Much!!" Karen Warther and Class from Pukalani Elementary School in Maui, HI. ​"Aloha, We had the pleasure of having Vicki White come to our School and present a Fabulous science show, She was prepared and had some wonderful experiments for our students to witness. It was amazing to see the look on the faces of the children. they were engaged and active participates as she asked for volunteers as well as asked them many questions. I believe she can provide opportunities to get kids thinking critically and ready to be excited about science. In the 21st century we want our kids to be thrilled with want they are learning about and Vicki can certainly do that. Vicki also provided a special hands on lesson for my Deaf education students in which they were able to see and feel a variety of cool experiments. She was considerate to my students needs and made modifications to the experiments to provide the best outcome for my students." "The Science Lady is rated number one by the children, parents and staff. Fun, exciting, and educational. What more could you ask for?" "Vicki White aka “The Science Lady” is very Knowledgeable about Science activities on the wonders of how certain things come to be. As an example of her wonderful Activities is lighting up people holding a fluorescent light bulb and the wonders of making foam which is just amazing. Her activities are educational and exciting to watch for all Audiences, kids and Adults"
"I have been very fortunate to have experienced Vicki White's science program both as a teacher and parent. Vicki was gracious enough to share many exciting activities with my class and really brought science to life for the students. My son also had the opportunity to participate in one of her science camps and had the time of his life. He came home with such an excitement for science and learned so much while having fun! He is counting the days until the next session!" "In recent month's, I have had the privilege of working with Mrs. Vicki White, aka: "The Science Lady". She came to present to an after-school class I was conducting and showed my students, through science, why they should stay away from drugs, alcohol, and poor choices that can effect the rest of their lives. To this end, I commend her for taking her time to assist me and the LACO Sheriff's Department S.T.A.R. Program's efforts to keep kids off drugs, away from violence, and make good choices." Would you like to leave a review? Contact us here!